Proposed title for the podcast. The Hedgehog and the Fox. His initial policies made it worse. Then he changed course, and things started to get better. And then the war hit, and the economy took off. In the first such study of its kind, scientists have found an approximately 30% drop in plastic bags on the seabed in a large area from close to Norway and Germany to northern France, and west to Ireland. The authors of the study, published in the journal Science of the Total Environment, claim the drop in plastic bag pollution, measured from 2010 – about the mid-point of charging policies coming into force – showed the power of such levies. “The fewer bags we use, the fewer we can lose, the fewer we can put into the environment,” said Thomas Maes of the Centre for Environment, Fisheries and Aquaculture Science, lead author of the paper. A UK levy of 5p per bag introduced in 2015 has already reduced single-use plastic bags given out by major retailers by 85% – down from 140 to 25 bags for the average person each year. The policy applies only to major retailers, but government is consulting on extending it to almost all shops. I hear that water is wet as well. Seriously people just do things out of habit and when something snaps them out of their routine - even something as small as 5p - they look at things differently. Of course this is why I rant that our local hospital should have the salad bar be free and charge a few cents more for the grilled food. A small change would cause some people to act differently. You really haven't, Aetius. You argued that rural America "was leading the world in renewable energy technology" in the 1930s and the proof you gave for that was one company that sold 20,000 windmills (worldwide) and one company that sold over 325,000 kerosene-powered generators. That company built the first commercially successful wind turbine for generating electricity in the world, and they weren't alone or operating in a vacuum. There were at least five other wind turbine companies (Wincharger, Miller Airlite/Winpower, Universal Aeroelectric, Parris-Dunn, Airline) and Delco had over 150 competitors. All were American, and focused primarily on the American market - though Jacobs turbines made it as far as Africa and the South Pole. In one estimate, Wincharger sold over a million of their turbines by 1938 (the estimate is near the end of the Popular Science article). It's not unreasonable to estimate that these companies sold a total of around 1.5 million wind turbines in less than 10 years. That was a phenomenal achievement for a brand-new technology. I'm not sure how else one would define "leading the world" if it doesn't cover having all the leading companies, developed virtually all of the new technology, and serving the vast majority of what promised to be a very large market. Do you have information on other companies or countries in the world that were competing successfully in this market and were ahead of American companies in the 1930s? Rural Americans wanted electricity and, short of getting wired to the grid, meant they needed some way to locally produce and store electricity. And the method they overwhelmingly chose was a fossil fuel-powered generators. The evidence is pretty clear that once available, they overwhelmingly chose combination plants just like today, and for the same reasons. The Delco systems sold more because they'd been in business for over a decade before the wind turbine companies even got started - Delco had sold 350,000 plants by 1928. Yes, my computer's power supply can convert AC to DC. And it does so with technologies and manufacturing methods that weren't available in the 1930s or for many decades after that. While that's true, their predecessors were commercially available in the 1920s and quite capable of doing the job. Nor has the market for appliances that run on different types of current vanished. If they were swimming upstream, why were their businesses growing rapidly ... during the Depression? Because rural folks--especially farmers--really, really wanted electricity? Which is why there was a growing market and companies meeting that demand. This directly undermines the argument that rural electrification was necessary because of market failure. Astute readers will notice that the sources you're linking do not mention independent and renewable power at all. They ignored the entire market because its very existence was counter to their narrative of market failure requiring the intervention of the REA. As for the other energy technologies you mentioned, two of them lost out in the marketplace of ideas for one reason or another--mostly because of the internal combustion engine and cheap oil. We've no way of knowing that they lost out in the marketplace, because the government was already heavily favoring and subsidizing the oil and coal industries - as well as wiping out the market for renewables with the REA. Even if Cooke's estimates were woefully low, rural residents were still looking at the choice between dropping a third to all of their annual income on something like a Delco Electric Light Plant and then paying to fuel and maintain it or paying a few dollars a month to a local electric co-op. They were, in fact, woefully low, as was noted earlier. The actual cost was almost a thousand dollars per home just to run the lines, which was more than twice Cooke's high-end estimate. And the costs weren't borne by someone else: the REA functioned by making loans, which had to be repaid by the rural electric customers. So the choice was actually taking a loan to buy an independent plant, or being forced to take a government loan to install grid electricity. I'm honestly not sure the point you're trying to make with this section outside of hydro was used to generate a lot of our power at the turn of the last century and now it isn't because 1) we need a lot more power than hydro can produce, and 2) we discovered it's a tremendously ecologically damaging way of producing power. I wrote that whole section because you asked me to support my assertion that early hydro plants had much lower environmental impact than later government-run large-scale projects like the Hoover Dam. Are you disputing that assertion? We did need a lot more power than hydro could provide. That power that was largely provided by government-built and/or subsidized coal-fired power plants, or nuclear power plants built with unsafe designs specifically to provide material for nuclear weapons. Many of those plants were built specifically to provide power to support rural electrification, and thus didn't need to be built at all. A 1930 census of agriculture found that only 13.4% of 840,000+ farms reported that the owner's dwelling had electric lights and that just 4.1% had electric motors for farm work. If companies like Jacobs or Delco were actually meeting the electrical needs of farms and rural residents then we wouldn't have seen those abysmally low numbers. Abysmally low numbers? Delco-Light started selling plants in 1916, sold 27,000 in the first year, and averaged 27,000 per year for the next 12 years. Do you have any idea how hard that is for a durable-goods company to keep up with those kinds of sales? This argument is like criticizing Google for not dominating the Internet search market ... in 1999, when they had less than 30 employees. Markets take time to develop. It's not like the REA was the first time people realized that the market wasn't meeting the electrical needs of rural residents. When Roosevelt assumed the Presidency on March 4, 1933, the market for new rural electrification investment no longer existed. This was precisely when the period when growth in renewables was taking off. It's almost like it was cheaper and made more sense. The REA was passed in 1936. By that time employment and other economic indicators had recovered to their pre-1929 crash numbers. Additionally, over a billion dollars of the REA's appropriation was allocated to hiring people, 90% of which had to be drawn directly from the local relief roles. Nope. Employment didn't fully recover until the mid-1940s, and only then because vast numbers of workers were drafted into the military. In 1937 and 1938 unemployment worsened dramatically, as did other economic indicators. This was directly due to the economic distortions created by the various New Deal programs, tariffs, and price controls. Because the f*cking government encouraged those thing, Aetius. The goverment is the reason coal is still in business. Tacking a little regulation on top of massive subsidies is like painting an oil rig green - it might make it look better, but it sure isn't "encouraging" better environmental behavior. Car companies didn't magically decide to make their cars more fuel efficient and less polluting. The government forced them to. And consumers will happily continue to buy massive, gas guzzling SUVs they don't remotely need just as long as gas remains relatively cheap. And why does gas appear to be cheap? The pressure to dramatically improve batteries came from the fact that consumers consumers started buying billions of portable electronic devices. Yes, because of course battery life, capacity, performance, and efficiency would not be advantageous at all in a market of millions of renewable energy systems. You're literally arguing my point for me. According to the homepage of the Windcharger enthusiast site you linked to the company sold 75% of the approximately million wind turbines built before 1950. And the overwhelming majority of those sales--like pretty much all its competitors--were for small wind turbines that did nothing but charge radio batteries. They were something that existed only because rural residents were being criminally underserved by electrical generation companies and it required government intervention to bring those Americans into the 20th century. And I'll take the decades of improved quality of life and productivity for those millions of Americans that the REA delivered over theoretically cornering the wind power market, something that would have taken decades to happen, if ever. What evidence, Aetius? Where are all the examples rural dwellers and farmers who bought both a fossil fuel powered generator *and* and wind turbine? If they bought anything at all, people bought one system or the other, not both. And because it seems this point needs to be continually made with you neither a wind turbine nor a gas generator was the same as being wired to an electrical grid. And yet that predecessor technology wasn't incorporated into the fossil fuel generators or wind turbine systems. The companies literally decided it would be easier (and cheaper) to manufacture special DC-powered versions of widely available consumer appliances than to have their power generation systems convert DC into AC. It's also why those appliances cost more. 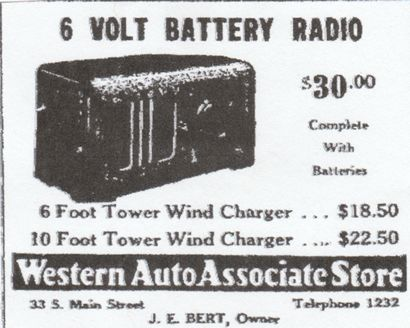 Here's an ad for a wind charged, battery powered radio that would set a family back $38.50 (about $650 current dollars) while they could pick up a normal electric radio for under ten bucks. If wind turbines and gas generators were actually meeting the demand of rural residents and farmers for electricity then the REA wouldn't have had any impact or local support. People would have still chosen to buy, install, and maintain their own power generation system. That that didn't happen shows that those local power generation systems left something to desire for most folks. Astute readers will notice that the most popular system sold--the Windcharger--literally did more than charge a radio battery. A typical Delco Light Plant put out all of 750 watts at full load or enough to "light 15 50-watt bulbs, or a combination of fewer lights plus an appliance or two." Did charging a radio battery or running a few lights and a coffee percolator really meet a rural resident's total demand for electricity or was it just giving them a small taste of what people who were wired into the electrical grid already enjoyed? Rural residents would have had to purchase much larger--and much more expensive--power generation systems to come remotely close to equaling what being connected to the electrical grid provided. The “intangible drilling costs” allowed oil companies to write off some of the costs for exploring for oil and creating new wells. When the tax break was written oil exploration was pretty much a gamble. It's not much different than the government allowing companies to write off their R&D expenses. You can make a very good argument that today high-tech geological surveys make this tax break obsolete (and I'd agree). The “depletion allowance" tax break allowed oil companies to write off a percentage of their production fields in much the same way that companies write off their capital equipment. Again, you can make an argument over the percentage of the allowed write-off and I'd probably agree. But I don't think that you can claim that those two tax breaks had fundamentally warped the market by the 1920s or wiped out the market for renewables. I'm not going to agree with you that the REA killed renewables because the market wasn't actually for renewables, it was for electricity. And distributed electrical generation--renewable or not--couldn't compete with the cost, availability, and capacity of hooking houses and farms up to an electrical grid. So which banks were making several hundred dollar loans to dirt poor farmers and rural folks with little to no collateral during the Great Depression, Aeitus? The REA functioned by having the federal government back loans to power generation cooperatives. Those loans had to be paid off over decades (ultimately the terms were 35 years). So farmers and rural residents really faced the choice of scrounging up a rather large chunk of cash to buy an independent electrical generation system that, at best, could power a few lights and appliances, or pay an REA-backed cooperative a couple of bucks a month for a lot more (and, effectively, unlimited) electricity. I take that back. They also had the option of paying the 2018 equivalent of several hundred dollars to run a single electrical device. Delco-Light had sold some 325,000 systems by the time the Great Depression hit. Ford went from cranking out 1,700 cars per year in 1903 to 500,000 in 1915 (with other manufacturers making several hundred thousand additional cars). If you want to go from the introduction of the Model T in 1908 then Ford went from making about 10,000 cars to over 800,000 by 1920 (with another 500,000+ made by other manufacturers). If you want to cover the same time period as Delco then Ford went from making 735,000 in 1916 cars to 1.5 million in 1929 (with other manufacturers making an additional 2.5 million cars). Durable goods manufacturers of the time were well able to grow and 27,000 units a year wasn't all that much. The disincentives to investment in electrical infrastructure left rural America increasingly distant from the rising standard of living in the urban and emerging suburban settings of the national economy. Lacking the greater productive efficiencies secured by the adaptation of electricity, productivity growth in agriculture, the industry that served as the central organizing principle for rural life, lagged other sectors in the economy over the 1880 to 1930 period. Rural demands for the newest manufactured items found in urban American homes — telephones, radios, refrigerators, washing machines, hot water heaters, and household appliances — were latent. Given the widening disparities between rural and urban settings, it was not surprising that rural Americans reverted to the cooperative lifestyles of the nineteenth century as the urban markets for their agricultural products collapsed in the Great Depression. The failure of the market to deliver affordable electricity to rural locales led to over thirty state rural power initiatives during the 1920s and early 1930s, as President Herbert Hoover argued that responsibility for rural electrification rested with state government (Brown, 1980, pp. 6 and 29). Governor of New York Franklin Delano Roosevelt aggressively promoted rural electrification, and the New York Power Authority was created in 1931 to develop a substantial new source of inexpensive hydroelectric generating capacity along the St. Lawrence River (Brown, 1980, p. 32). But the Depression led to the collapse of many state power authorities and further raised the bar in discouraging private investment in rural electrical infrastructure. When Roosevelt assumed the Presidency on March 4, 1933, the market for new rural electrification investment no longer existed. It's almost like rural residents were absolutely desperate for electricity--any electricity--and the modern benefits that came from it. You're reading things as if farmers and rural residents craved renewable or locally produced power. The reality was that everyone else in the nation had been benefiting from electricity for decades and rural residents wanted in on the conveniences--and labor savings--that the modern world could provide. Having a wind turbine that let them charge a radio battery wasn't ever going to be a replacement for being connected to an electrical grid. It was a stopgap measure at best. Who knew balancing national energy policies with environmental concerns could be so complicated? Because the carbon cost of gas has been externalized. Because politicians don't want to be the ones who raise taxes on gasoline. Because consumers don't want to pay $5 a gallon. Because expensive gasoline would slow economic growth. Again, balancing energy policies with environmental (and economic and political) concerns is complicated. There have been hundreds of millions of cars manufactured and even that market wasn't large enough to dramatically improve battery technology over the years. It took a market of billions of small, rechargeable devices to trigger real investment in improving batteries. A market of a few million rechargeable wind systems would not have triggered a battery revolution. Unfortunately the plastic bag ban here in California didn't change my plastic bag consumption, it just made me buy plastic bags instead of reusing the ones I got from stores. I guess in the bigger picture it helps, but for me it was just another tax. I bet you're less likely to just let them go in the street, however. In DC, the bans on styrofoam food containers, plastic bags and bottles led to massive reductions in those items in the waterways (and neighborhood gutters, streets, etc.). They were so successful that they are working on cups next. The Anacostia river will soon be swimmable, although with all the toxins in the mud, bottom-feeding fish and predatory fish consumption is not advised. I didn't see a "The US infrastructure is crumbling" thread. That's so depressing. There should be an infrastructure thread. I remember some heavy rains when my wife and I were in Sydney and I never saw anything like that. They get outbreaks of legionnaires disease here and there caused by constantly running AC systems, but as far as I could tell the underground stations were clean and airtight. America should have world class infrastructure. It's nice seeing those $1.5 trillion in tax cuts hard at work. America should have world class infrastructure. I can only respond to this notion with a resounding “no it shouldn’t”. The country has done precious little to work towards world-class infrastructure in the last 50 years. America has an accordingly well-deserved sh*tty infrastructure, because that’s what we’ve bought and paid for, consistently, over decades. The long and short of it is that infrastructure = socialism, and we'll have none of that here, thankyouverymuch *waves tiny flag*. My alternative answer is that we do have a world-class infrastructure, and it’s called “the military”. But even your spoiler isn't true. We spend tons of money on the military but our troops have lacked critical supplies. More bombs/less body armor. So, I attended a lunchtime lecture at work about the impacts of climate change on aircraft design. Which, despite that very much being up my professional alley, I had never given thought to. Interesting! I'd also be interested to know how industrial engineering/architecture stuff is "hopefully" adapting design. Edit: Any general takeaways you can share? It's easier to just kick a couple people off a plane than try to pay for the cost of researching, designing, and building a whole fleet of planes to take that into account? Well clearly it's easier as an airplane manufacturer to do that, but it's a fast-track to bankruptcy if you're an airline. But the reality is that an airplane that rolls out of the factory tomorrow is likely still going to be flying in 2050, or 2060, or 2070. And the reality is that it's designed for today's world, and today's climate. And even with that said, if it's flying out of somewhere very hot today, like Abu Dhabi, or very high (several Chinese, Bolivian and Peruvian airports are > 10,000ft above sea leve), you're already sacrificing payload just to get off the ground. The problem with climate change isn't just that it makes everything hotter, it's that it smears out the bell curve of temperatures, widening it. So "hot days" 3 standard deviations away from the mean become a much more commonplace event than they are today. The logical extension of that is you need to overdesign your airplane in terms of lift and thrust to accommodate that. And at a certain point, you get into a death spiral - make the wing bigger to add more lift. Now the airplane's heavier, so we need bigger engines to add more thrust. Now we need more fuel to run those engines, so the airplane's heavier. So now we need to make the wing bigger still, etc etc. With really big airplanes, yer 747s, 777s and A350s, you can't make the wingspan any wider, as that airplane will no longer fit into airports. Which, incidentally, is why the 777X has folding wingtips! One really interesting takeaway was that all our climate change models give us great estimates of what's going to happen to temperatures at sea level. No-one really knows how it affects temperatures at 37,000 ft.
Nah. They'll just add more seats. I know you're joking, but on hot days where mass is the constraining factor, not volume, adding more seats and more passengers is not a successful correction. Of course. But if overpacking flights becomes the norm, than bumping people won't be as painful to their bottom line. It costs an airline more to bump a person that they pay for a ticket. Why? Because you still have to incur the cost of a seat for that passenger on a different airplane, but now you also have to pay them off (ever gotten one of those $500 vouchers for getting bumped? ), and potentially pay for a hotel for them to boot. Unless you create a new economy type that specifically voids the right to compensation if bumped (alongside only one bag allowed), then raise all other ticket prices shortly thereafter but advertise with "tickets as low as [Uber economy prices]". Maybe with some anti-bump insurance options. Now one might say that such a ticket would run afoul of customer protection regulations, but how long will those stay in place? I imagine that there would be a move by airlines to sell more stand by and less confirmed seats to avoid costs associated with bumping someone. Alternatively on the plus side making air travel less available could push the development of improved remote presence tools. Trump has ended all future funding for the Climate Monitoring System. Currently signed grants will continue to be paid until their terms expire. While several of the programs he threatened were specifically called out in the last budget to protect them, the CMS program was not, giving Trump the power to unilaterally decide that it's not a necessary part of NASA's mission statement. To be fair, Congress sets the budget, not Trump. They should be held responsible for budget changes as well. I don't think that there is anything wrong with letting subject matter experts in the agencies decide some of the implementation details. If Congress micromanaged every $10 million dollars spent then the budgets would be tens of thousands of pages long (rather than the 878 pages the last one was). Those tax cuts aren't going to pay for themselves (even though both Congress and Trump said they would)!